Sweetfrog Sweetness for the Superheroes of Special Olympics! Please come out on Tues August 20th from 4 pm to 10 pm in support of Virginia Special Olympics. During this time 25% of purchases where the customer mentions “Ask Gina & Company” or “Dulles Plane Pull” will go to donations we are trying to raise. 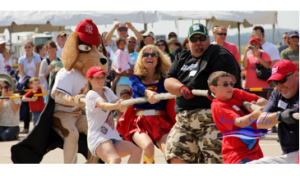 On Sept. 14th a band of Ask Gina & Company Superheroes will be competing against other teams pulling a 164,000 pound plane. The Dulles Plane Pull is an event that is a fundraiser for Virginia Special Olympics. Will you please be OUR superhero and show your support for our team and Special Olympics. Sweet Frog at Ashbrook Commons Plaza.